Many years ago, Harvard psychologist Dr. Gordon Allport pointed out a secret power. It seems applicable to whatever stage of life we're in. Dr. Allport said that the striving for a goal beyond one's reach is thought by numerous psychologists to be the greatest power to unify the diverse elements in a personality. As an adolesent, the overriding goal of playing world championship chess against the Russians affected every part of Bobby Fischer's life. It established his priorities. What he did each day. Where he went. How much he slept. How he viewed the world and life in general. Bobby came from a broken family. Abandoned by his father. Raised by a single mom. 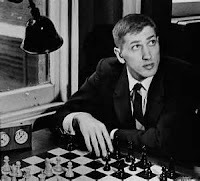 As it turned out, the goal of being a great American chess champion was his "beyond reach." His whole life was ordered by His desire to be a world chess champion. This single dominant goal unified his life during a period which could had been very fragmented. I'm reminded of Brandon, who's a serial womanizer and bar owner. In our therapy work, he'd push to save his family and want to indulge in his addictions. He felt split and torn. Then, one day, he came to know Christ. He made a total commitment of his life to Him. That changed everything about him and how he lived his life from thereon. Imperfect though he was, Brandon's energies and abilities gradually became more focused and working together. He now have a point of reference to unify everything about his life. His self. His family. His relationships. His business. Old values and experiences are seen by Brandon as Christ sees them. "The staking of an overall goal compels the unity of the personality in that it draws the stream of all spiritual activity into its definite direction," as psychologist Dr. Alfred Adler put it.